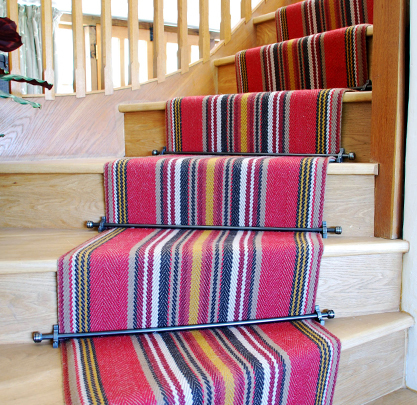 Project: The Chatham turkey red Roger Oates stair runner installed in a barn conversion. 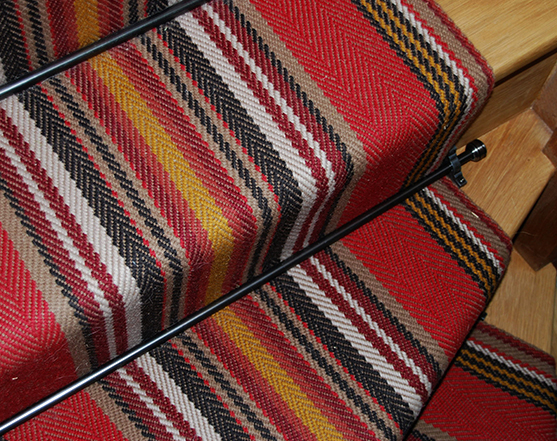 The brief: Turkey Red striped runner was installed in a barn conversion project, where solid brass stair-rods, again in a pewter finish, have been used to complement the carpet and other finishing in the property. The installation shows how Roger Oates' flat-weave runners can be fitted around a bend in a staircase to give complete continuity of pattern, whilst STILL BEING LAID IN ONE PIECE, something NOT possible with standard carpets. The whole upper floor was also fitted in a neutral, natural textured carpet.